To play this video, please upgrade your web browser. 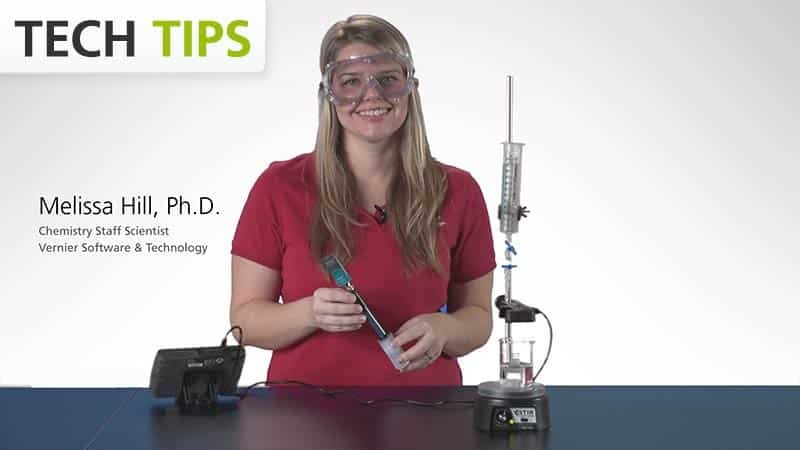 This video demonstrates the use of our Go Direct pH and Go Direct Drop Counter to conduct a titration of hydrochloric acid with a basic sodium hydroxide solution. 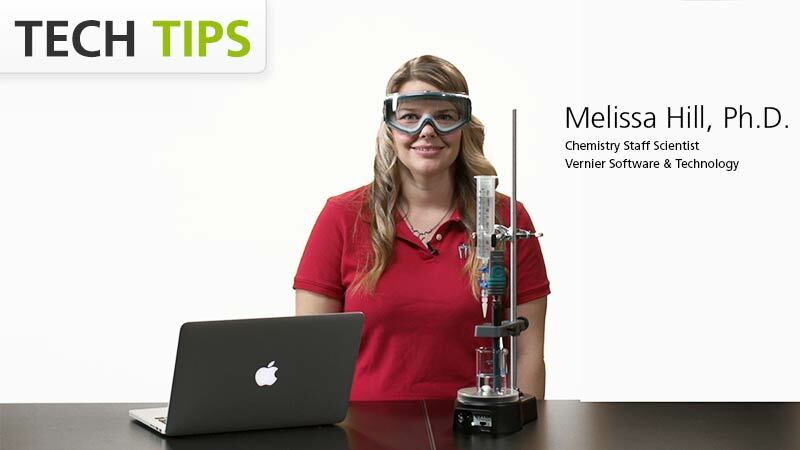 Follow along as our Chemistry Staff Scientist, Melissa Hill, PhD, discusses how to set up your experiment, wirelessly connect your sensors to your device, and analyze data using our free Graphical Analysis™ 4 app. 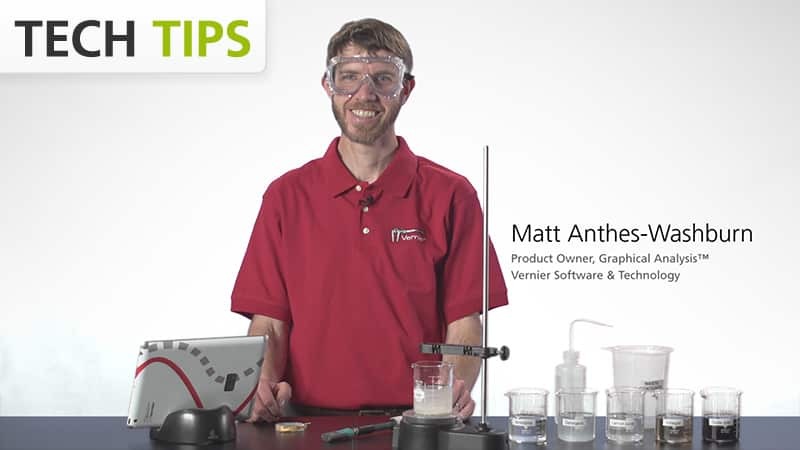 In this video, we will be investigating a strong acid, strong base titration with our Go Direct pH Sensor, and our Go Direct Drop Counter. A titration is a process used to determined the volume of a solution needed to react with a given amount of another substance. 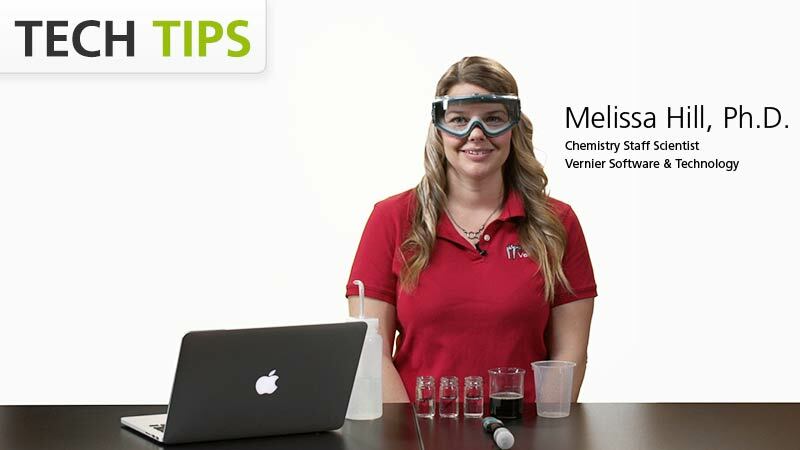 In this experiment, you will titrate hydrochloric acid with a basic sodium hydroxide solution. 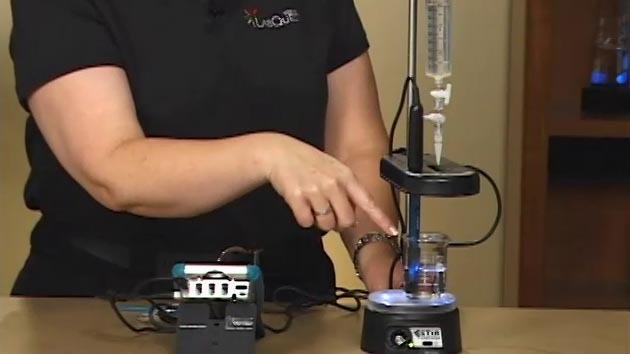 To get started, I want to make sure I have assembled my titration apparatus. I have my stir station, with the utility clamp holding my reagent reservoir for the drop counter. 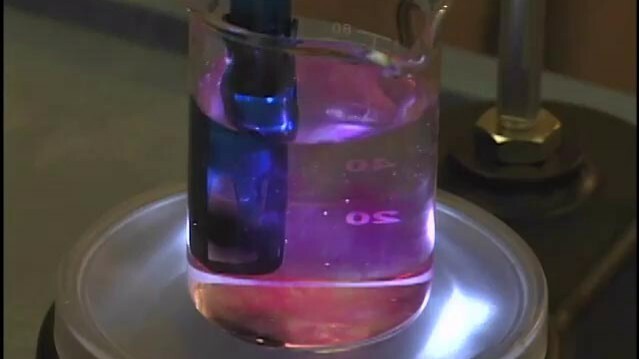 Sodium hydroxide is in the reagent reservoir. The drop counter is attached, the pH probe is in the electrode opening, and the drops from the reagent reservoir go through this opening. In the beaker, I have a magnetic stirring bar, 10 milliliters of hydrochloric acid, and 30 milliliters of distilled water, with a few drops of phenolphthalein indicator. The Go Direct pH Sensor and Drop Counter can be connected via USB or via Bluetooth to your platform. The platform can be a ChromeBook, Mac computer, Windows computer, iOS, or Android device. To get started, make sure you have downloaded the Graphical Analysis 4 app from our website, or from the appropriate app store. Since I will be taking data via Bluetooth, I will now turn on my pH probe and drop counter. I'll then launch the GA4 app, and select Sensor Data Collection. I'll then connect to my pH probe, and to my drop counter. Select 'Done'. Since my titration is all ready to go, and the Graphical Analysis 4 software has auto-identified my drop counting mode of data collection, I can go ahead and press the 'Collect' button, and it will wait until the first drop passes through the slot. At this point, I can open the stopcock on my reagent reservoir, and the drops will go through the slot, and I see the indication of that on the drop counter and on the software. The drops should be coming out at about one per second. 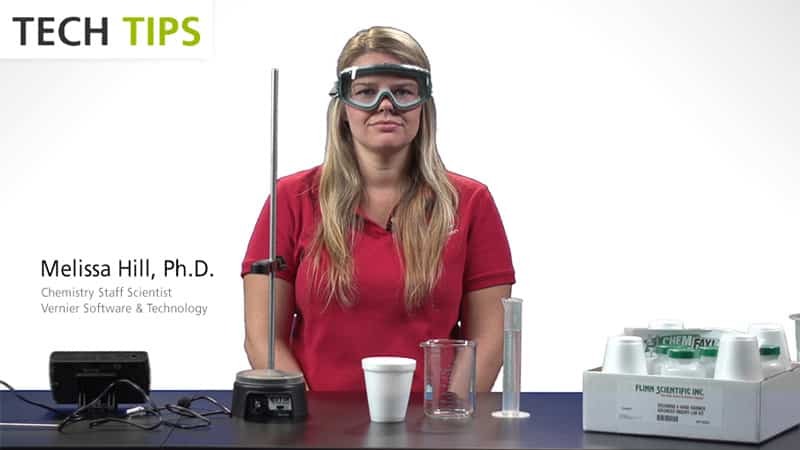 The slower the drops, the better the titration data. Once my titration is complete, I can close the stopcock and stop the data collection. Now, I have a little bit of work to do to determine the equivalence point. I have a few different options for determining this. First, I can tap along the graph, and find the volume where the pH changes most dramatically. Alternatively, I can take the derivative, which will give me a peak where the change in pH is steepest. To calculate and graph this, I need to add a calculated column. First, I will remove the examine line. And then from the square icon, change the view to Graph and Table. Then, I click on the dots in the pH column, and select 'Add Calculated Column'. I will rename this "First Derivative." Tap on 'Insert Expression', and select 'First Derivative', making sure column Y is volume, and column X is pH. Tap 'Apply'. To autoscale, double-click anywhere on the graph. Now, to get the volume where this peak of my first derivative happens, I can use the statistics feature in Graphical Analysis. To do that, I select the Graph Tools icon, 'View Statistics', and scroll down to the First Derivative data, where the max is occurring at 8.393 milliliters. Knowing the precise equivalence point, I can determine the exact concentration of my hydrochloric acid.